Generating fake tweets is common these days, especially fake tweets for celebrities like Imran Khan, Trump etc. We usually see make funny and sometimes annoying fake tweets on social media, most of them are generated using fake tweet generator tools and twitter simulators. 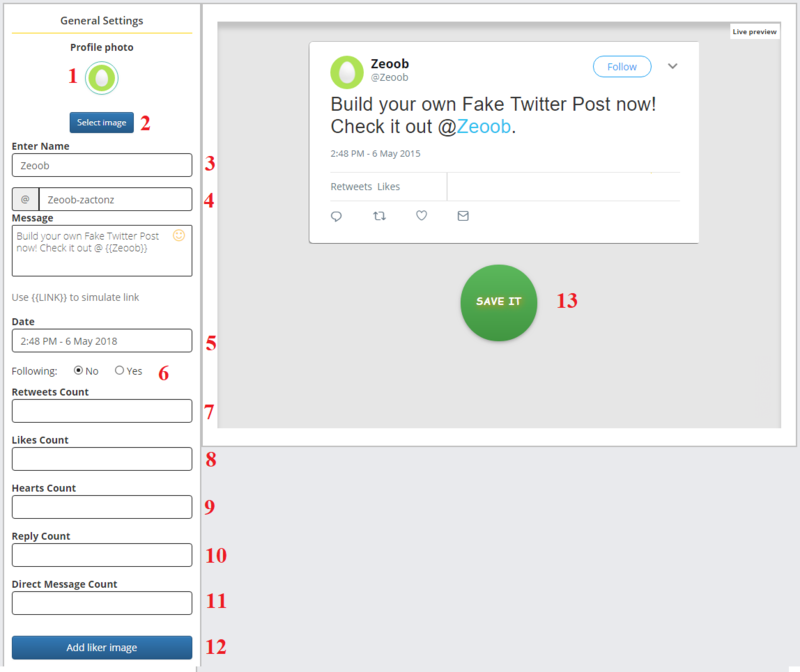 Team at Zeoob developed a simple but comprehensive twitter simulator to generate fake twitter tweets online, with your desired content and for desired celebrity with in no time. You can imitate a fake twitter tweet to prank your friends. Using our fake tweet generator tool, you can make a variety of tweets and there no limits. Your profile picture for twitter account. Click on this button to upload twitter profile picture. Type twitter account name( account title). Type username(short url) of twitter account and find below input area to type your desired tweet text. Type and increase fake tweet likes as many as you want to enter. Type number of heart counts, use same technique as mentioned in point 7. Upload fake images, for those who liked your tweet. Click on this button, if you want to add more images. It will upload 1 image per click. Once you think that you have build your desired fake tweet for your select celebrity or friend, then click on this big Save button. Now you can download your generated fake tweet as image and you can also share on social media. One the of best fake tweets generator. ʏour blog on my iphօne during lunch break. I enjoy the info you provide here and can’t wait to take a look when I get һome. I’m amaᴢed at how quick your blog loaded on my phone ..
I’m not even using ԜIFI, just 3G .. Anyways, good blog! It’s actually a great and useful piece of tools. Best fake tweet generator, i really loved it. it, you’re a great author.